Help prevent shear and friction and protect fragile resident skin with the Invacare Glissando Gliding mattress. For facilities that prefer the 3 inch foam raised side, the SRS2080RSR is now ready to ship. The raised side includes a 36” ingress/egress for easy resident access. The cover continues to have welded seam for infection control. 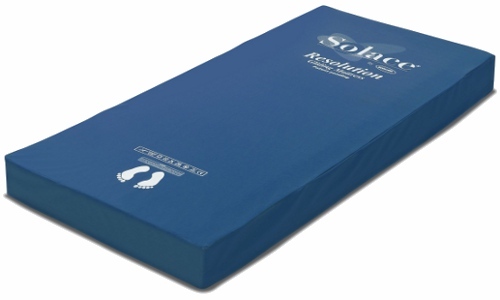 Like the regular glissando gliding support surface, this patented mattress is developed for high risk residents and those who require therapy up to stage II wounds. Invacare’s patented design supports the resident with the top layer while the bottom layer glides as the bed is articulated. The unique action helps prevent unnecessary pressure and strain on skin and tissue: A clinical study demonstrating this benefit is available, by asking for 1stSeniorCare to send it to you.